Located on the private island near Motu Piti Ananu, Bora Bora Lagoonarium is a family-run natural aquarium and water park. Offering activities like swimming with marine animals, ray and shark feeding sessions, circle-island tours in an outrigger canoe, and snorkel visits to the famed coral gardens at the southeast end of the main island are some of its key features. It is the best place to relax, unwind and observe the marine animals in their natural habitat. Half-day and full-day tours are organised at the Lagoonarium. You can also opt for a stay at the small guesthouse operated by the owners of the Lagoonarium called Pension Lagoonarium on the main island’s east coast. Dive into the water, swim with the sharks, turtles and rays. Enjoy the tropical fish around your feet in warm shallow waters and enjoy a tropical BBQ meal on your visit! Prices for adults range between 6200-9500 XPF. Full day and half day tours are available. How popular is Bora Bora Lagoonarium? 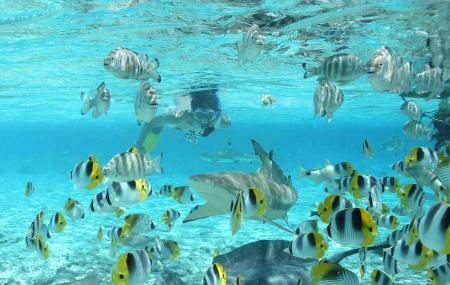 People normally club together Pure Snorkelling By Reef Discovery and Leopard Rays Trench while planning their visit to Bora Bora Lagoonarium. People also prefer to start their day with Bora Bora Lagoonarium.